No longer available new from Deere, except for current dealer inventory. This is a good used john deere 4100 series quick hitch. Looks decent shape see pictures Sold as is. Buyer pays shippinh. PART # BLV10880. JOHN DEERE. QUICK HITCH KIT. HONDA, JOHN DEERE, STIHL, EXMARK, REDMAX, TORO, ARIENS AND BOSS. -LOCAL PICKUP CAN BE ARRANGED DURING HOURS OF OPERATION. John Deere Quick-tach (Quick Attach) hitch hydraulic cylinder / ram with a short set of hoses and fittings. In good used condition! 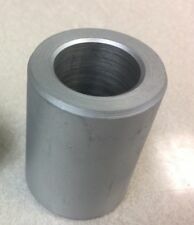 Deere lists this part number cylinder as being used as both angle and lift cylinders in 182 applications including 425, 445, 455, X465, X474, X485, X495, X565, X575, X585, X595, X700, X720. FOR SALE IS A USED, JOHN DEERE, 425/445/455 QUICK HITCH, HOSE RETAINER RING, REMOVED FROM A JOHN DEERE 425 GARDEN TRACTOR. New Custom Built 8 Place Weight Rack for John Deere Quick Hitch. Fits John Deere Lawn and Garden Tractors. Painted Rustoleum John Deere Green. When in doubt, check with your local dealer. Front hitch is a m0hitch. 54" Blade is m01490. The blade has a small ding/crack on right (passenger) side maybe a 1/2" long max - see rusty spot on photo. 47" SNOW BLOWER FOR JOHN DEERE 2210 & 2305. -MOST OF OUR USED PARTS ARE FOR JOHN DEERE, CUB CADET, KUBOTA, TORO, JACOBSEN, WHEEL HORSE. -EACH ITEM IS DESCRIBED TO THE BEST OF OUR ABILITY. -LOCAL PICKUP IS AVAILABLE IF NEEDED DURING OUR HOURS OF OPERATION. JOHN DEERE 425 (YEAR 2000). -MOST OF OUR USED PARTS ARE FOR JOHN DEERE, CUB CADET, KUBOTA, TORO, JACOBSEN, WHEEL HORSE. -EACH ITEM IS DESCRIBED TO THE BEST OF OUR ABILITY. -ENGINE: KAWASAKI FD620, 2123 HOURS. Generation Xseries tractors. Full color quick instructions are included. SKU: AM119973. Style: AM119973. Part: AM119973. MPN: AM119973. Part Number: AM119973. New hydraulic cylinder that fits on the Quick Tatch hitch for the following units 318 332 332 420 430 F910 F912 F915 F925 F930 F932 and F935. The bushings are 1 7/16 OD, 7/8 ID and 2" wide. Broom looks OK. You agree to wave. WORTH IT FOR YOU TO DRIVE HER TO PICKUP. ( form no. OMM146113 issue f2 (2002 (32 pages). To give you the best manual that will serve it's purpose of clarity, utility and longevity. Knowledge is the most valuable tool, So Don't Work Harder, Work Smarter With This Book! ). 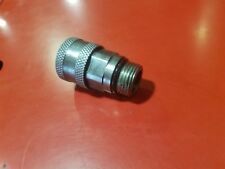 Replaces John Deere part number LP19969 and LP25004. Frequently used with I-Match quick hitch on John Deere models 2210, 2305, 1023E, 1025R, 1026R and other compacts and subcompact models. That would be 1st, 2nd, and 3rd Generation Xseries tractors. There are two styles of Quick Hitches used on these tractors, early and late style.